*Please make sure to check the MTA website for the latest updates about changes to subway service. The Museum offers free parking but space is limited. We encourage the use of public transportation whenever possible. From West and midtown Manhattan: Take the Midtown Tunnel to the Long Island Expressway. Use Exit 22B, Grand Central Parkway West. Exit the Grand Central Parkway at the first exit, Tennis Center (9P), turn right and follow signs to Museum. From Brooklyn: via Brooklyn Queens Expressway (BQE) to Long Island Expressway (LIE) Eastbound, to exit 22B Grand Central Parkway West. Exit the Grand Central Parkway at the first exit, Tennis Center (9P), turn right and follow signs to Museum. From North and RFK Bridge: via Grand Central Parkway East, Take Exit 9E (Citi Field, BJK National Tennis Center). Stay in the right lane and exit at Northern Blvd, Citi Field exit. At light, turn right. Follow signs to Queens Museum (pass both Citi Field and the BJK National Tennis on left). Queens Museum will be on the left. From East and Long Island: via Long Island Expressway (LIE) to Grand Central Parkway West. Exit the Grand Central at the first exit, Tennis Center (9P), turn right and follow signs to Museum. Take #7 Train in the direction of Flushing, Queens. Your stop is Mets-Willets Point, the second to last stop on the 7 train. Follow the signs to Flushing Meadows Corona Park (exit left after the turnstiles), walk up the exit ramp of the station, over the boardwalk and into the park. 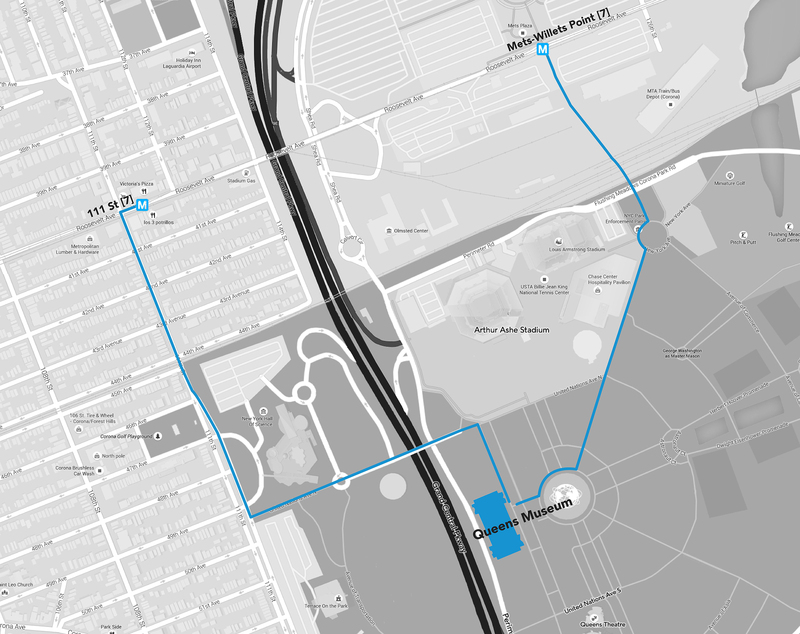 Follow the path past the tennis center to the Unisphere. The Museum will be on your right. You can also get off at the 111th Street subway stop. Walk south towards 49th avenue and take a left into the park. Follow the path, past the garden roundabout and over the highway. You will see the USTA National Tennis Center on your left. The Museum will be on your right. There are two entrances to the Museum, one facing the park and the other facing Grand Central Parkway. Please allot 15 minutes for the walk from either subway station to the museum. You can use any ride-sharing app to get to the Museum faster, which costs anywhere between $4-8, depending on which app you use.